Watch list — RandallAnthony Communications Inc.
With global demand rising and supply sources flattening, here are three new Canadian diamond mine projects worth paying attention to. According to a recent report by De Beers, over the last 140 years almost 7,000 kimberlite pipes, the volcanic rock that hosts diamonds, have been discovered and sampled by geologists. Of those, about 1,000 have contained diamonds, among which only about 60 have been sufficiently rich to be economically viable mines. Mason adds, “The explorer faces fearsome odds of success and then, even with success, faces lengthy capital requirements.” Renard is a case in point. This past June, Stornoway raised $946-million Cdn to build the mine, which was originally discovered in 2001. Renard, which will be Quebec’s first diamond mine, is expected to employ over 500 people and produce 1.6 million carats of diamonds annually once up and running in the back half of 2016. Renard diamonds have been valued at $190 per carat, a sizeable premium compared to a global average of $107 per carat according to the Kimberley Process. In addition, the distribution of diamonds recovered from samples at Renard indicate that the mine may produce at least one 100-carat stone every two weeks, which is significant given that diamonds are exponentially priced – the larger the size, the more valuable the diamond typically is on a per-carat basis. Stornoway recently announced that the Renard processing plant now under construction would allow for the successful recovery these large stones. What is known is that Friedland’s Peregrine Diamonds is sitting on one of the most valuable untapped diamond deposits in the world. The company’s 100 per cent-owned Chidliak project on Baffin Island, Nunavut, hosts an initial inferred resource of 7.5 million carats valued at $213 per carat. However, Chidliak’s current resource estimate only includes one kimberlite pipe, CH-6, to a depth of 250 metres. There are seven other pipes on the Chidliak property that show economic potential, strongly indicating that the overall resource could be multiple times larger as additional pipes are sampled and the resource is expanded at CH-6. Seeing the opportunity that the current fundamental backdrop provides, Friedland notes, “Over the next 12 months, our focus is transitioning Peregrine from an exploration company to a mine developer. 2015 is all about further building the company’s resource leading up to a PEA (Preliminary Economic Assessment) in early 2016.” Friedland continues, “Given our strong shareholder base, we’re confident in our ability to fund this transition for the company.” Industry heavyweights Ned Goodman and Eric’s brother, Robert Friedland, are significant shareholders of Peregrine. The company recently completed a $15-million rights issue in October that will provide capital for the company to continue progress at Chidliak in 2015. Stornoway Diamonds’ (TSX: SWY) 100 per cent-owned Renard project is one of just two diamond mines being built in Canada, and one of only five large-scale mines in the world set to commence production within the next five years. Outside of Canada, indications of new and existing diamond production are sparse to say the least. “There is reason to believe that future global supply is just not going to be great enough to keep up with new demand going forward,” explains Eric Friedland, CEO of emerging developer Peregrine Diamonds (TSX: PGD). Given that a new diamond mine typically takes at least 10 years to develop after an initial discovery is made, one can get a glimpse of what new supply will look like a decade from now. Beyond the addition of Quebec’s Renard mine, and a small handful of other new mines being built globally, the sources of additional production needed to meet an impending supply crunch remains unclear at best. In addition to the uncompromising quality and beauty, a Canadian diamond’s allure also stems from it provenance. Canadian diamonds have a reputation of being associated with the industry’s most responsible environmental and labour practices. This practice starts at the very early stage of grassroots exploration and continues all the way through mining and land reclamation. “It’s critical from the earliest stages of exploration to maintain an open, honest and mutually beneficial relationship with all stakeholders,” says Ken Armstrong, CEO of Canadian diamond explorer North Arrow Minerals (TSX-V:NAR). North Arrow has amassed a portfolio of seven high-potential Canadian diamond projects from central Saskatchewan to the Melville Peninsula in Nunavut. The company’s Pikoo and Qilalugaq projects, now being evaluated in partnership with Stornoway, are perhaps two of the most significant exploration projects in the industry. Pikoo, situated 140 km east of La Ronge in Saskatchewan, is credited as Canada’s newest diamond discovery. Qilalugaq, in Nunavut, hosts the eastern Canadian Arctic’s largest diamondiferous kimberlite pipe with a current inferred resource of over 26 million carats, including a population of fancy yellow diamonds. 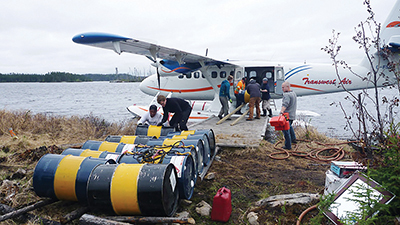 The company recently completed a 1,500-tonne summer bulk sample program at Qilalugaq, of which six of 10 workers in the daily field crew were local Inuit hires. “It’s really unique to be able to conduct exploration on a project in Nunavut where local employees can sleep in their own beds at night,” Armstrong notes, indicating Qilalugaq’s proximity to local community Repulse Bay. The Qilalugaq bulk sample is currently being processed, and the resulting diamond parcel will be sent to Antwerp, Belgium, early next year for valuation. The diamond value will then be used to complete a PEA in 2015. To view this feature as it appeared in Report on Business magazine, please click here.